Marmite and Listerine are often quoted as common examples for a peculiar kind of reason – HATE. These are classic examples of brands that have spun a hatred related angle into a brand positive. Just as a very quick recap, for the uninitiated. Marmite – An English brand is essentially a Yeast Extract commonly used as bread spread (and many others) and is known for a very.. let’s say peculiar kind of taste – that has nearly polarized the world into 2 camps: People who love it and people who hate it. Through the decades it has established itself as a truly iconic brand based on just this simple ‘brand truth’ – you either hate it or love it. In fact it goes the extra mile in communicating to us that people who hate it do indeed find it repulsive to the highest degree. Listerine – on the other hand was originally known for its very ‘non inviting’ medicinal kind of taste. When competitors began to launch mouthwash known for its ‘good taste’, Listerine smartly (and courageously) stuck to its ground and attributed its ‘virtues’ to its taste – that people hate twice a day. Through the years, these brands have leveraged upon this ‘HQ’ (Hatred Quotient) and spun it into an incredibly positive sounding/ stimulating discourse about themselves. 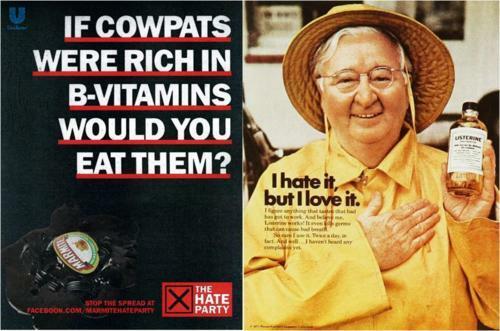 Spurred by these very interesting examples of brands using ‘hatred’ as a nearly irresistible proposition, I tried to search around and see if there are any other similar examples. After about a few unsuccessful days of online crawling for ads/ brands/ campaigns high in HQ, I was almost about to give up when I stumbled into this. The browser that you have loved to hate campaign by Microsoft. Now taking a step back and pulling all these 3M’s (Marmite, Mouthwash, Microsoft) together, I guess, these brands/executions are more different than not from each other. Fundamentally the reason they jumped into the ‘HQ’ bandwagon is for very different purposes. Marmite –the story goes, that these 2 creatives (Flintham and McLeod) from DDB London didn’t actually set out to think of any new slogan. In fact it just struck to them as a fundamental brand truth as that’s how Flintham and McLeod saw the brand ; While Flintham loved the spread, McLeod hated it and thus was born a powerful idea that was then presented to the client, who in turn courageously embraced all its possibilities. The rest, as they say, is history. In essence, You either love it or hate it – has been the fundamental brand truth and thereby the core positioning that it had and still has in the minds of the consumers. Listerine, as mentioned above, got into the hatred related discourse only in response to a competitive onslaught. Over the years, Listerine has been launched in various flavors most of which are more inviting and non medicinal in taste as opposed to the original Listerine. Naturally it is no more using this erstwhile campaign around the taste that people hate twice a day, as this was originally meant to be a tactical response and not much of a strategic initiative from the part of the brand. Microsoft IE9, I guess, is a tricky case. It is neither a strategic move (obviously) and nor is it a tactical initiative. I guess it has been envisaged as a stand alone campaign to create awareness about the new browser – presumably by trying to ‘cut through the clutter’. In simple words, Microsoft, I guess wanted to gate crash into your chrome/firefox browser experience by entertaining you with a video of self mockery and reminding you that it is the browser you loved to hate, hoping that you would find it funny and thereby pass it over to your friends. As a result of the ensuing viral phenomenon it expects that it could count upon a good number of downloads and hopefully some converts along the way. Period. The browser you loved to hate campaign reminded me of the Domino’s Pizza campaign aired 2 years ago. But what differentiates both is that the Domino’s campaign was not a self mockery exercise for fun, it had elements of communicating a serious, critical, introspective and an honest look that they had cast upon their own products, talked with the consumers and thereby made what they call as a ‘PIZZA TURN AROUND’. On the contrary, the IE9 campaign puts its own authenticity into question, especially when you become aware that the IE8 was launched in 2010 with pretty much similar fanfare and positioned as a browser that enables you to browse with confidence. And just after an year it comes out and tells you that it’s actually a browser that you could potentially have hated. Wow! from selling ‘confidence’ to seeding ‘hatred’ – that was quite a journey! Are there any other brands that have sought to ride upon the HATRED bandwagon? This entry was posted in Uncategorized and tagged Authenticity, DDB, Hate, IE8, IE9, Listerine. Love, Marmite, Microsoft. Bookmark the permalink.